Here is another book that should be on the nearest handy shelf, of anyone passionate about slowing down and also reversing climate change. Why? 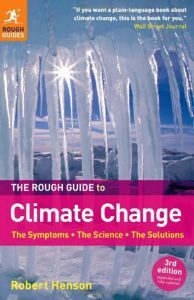 This book is a wonderful compendium of Climate Change insights. Robert Henson has compiled a guide with three helpful perspectives. His book covers The Symptoms and The Science and The Solutions. You’ll want to have this book handy as you read other climate and global warming books. Why? This book’s three broad perspectives will put any other climate issue reading you do into context. And the context Henson gives you will put your grasp of climate issues on a solid footing. Let me illustrate. My career has given me a solid grasp of flood issues. On page 72 he writes this: “Are floods increasing? It is surprisingly hard to compile a global picture of whether floods are becoming more frequent or intense due to climate change. In part, that’s because the chain of events that leads from an unusually have rain to a flood involves many factors other than immediate weather…” I can attest that this is true. He goes and gives several nice examples and then lists important factors for you to consider. Further, the way he writes will clarify your own thinking and help you to express your insights to others. This is a must-have book.